Somerset House is an 18th century neoclassical building which faces north onto the Strand in central London. Wings were added to the north and south in the 19th century. 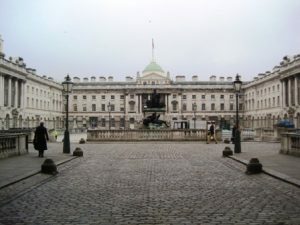 Somerset House is the location of the Courtauld Gallery which has an acclaimed collection of masterpieces by such artists as Botticelli, Cezanne, Degas,Manet, Monet and Renoir. It also hosts contemporary arts and design exhibitions. In the summer, 55 modern playful choreographed fountains spurt in the courtyard and are a hit with children, especially on hot days. During the winter a popular ice skating rink takes their place. There is also a cafe with a terrace and a restaurant. The Courtauld Gallery charges an entry fee.